Celery is believed to be originally from the Mediterranean basin. Ancient literature documents that celery, or a similar plant form, was cultivated for medicinal purposes before 850 B.C. It’s claimed medicinal purposes were probably attributable to it’s volatile oils, contained in all portions, but mostly the seed. During ancient times Ayurvedic physicians used celery seed to treat the following conditions: colds, flu, water retention, poor digestion, various types of arthritis, and liver and spleen ailments. Woven garlands of wild celery are reported to have been found in early Egyptian tombs. Celery was considered a holy plant in the classical period of Greece and was worn by the winners of the Nemean Games, similar to the use of bay leaves at the Olympic Games. The Nemean Games were conducted every second year, starting in 573, in the small city of Nemea in southern Greece in the Poloponnes peninsula. The Romans valued celery more for cooking than for religion although much superstition was connected with it. The celery plant was thought to bring bad fortune under certain circumstances. Although celery is thought to be from the Mediterranean, indigenous "wild" relatives of celery are found in southern Sweden, the British Isles, Egypt, Algeria, India, China, New Zealand, California and southernmost portions of South America. However it is doubtful that it’s center of origin was that extensive. The Italians domesticated celery as a vegetable in the 17th century resulting in selections with solid stems. Early stalk celery had a tendency to produce hollow stalks. After years of domestication, selection eliminated this characteristic as well as bitterness and strong flavors. Early growers found that the naturally strong flavors could be diminished if grown in cooler conditions and also if blanched. Blanching is the practice of pushing dirt up around the base of the stalks to prevent sunlight from turning the stalks green. There are two types of stalk celery varieties, self-blanching or yellow, and green or Pascal celery. In North America green stalk celery is preferred and mainly eaten raw although it is also eaten cooked. In Europe and the rest of the world self-blanching varieties are preferred. Celeriac is very popular in Europe where it is eaten cooked or raw. Smallage is grown in Eastern Europe and Asia for it’s seed as well as to use the aromatic leaves to flavor cooked food and to garnish plates. In some areas celery and celery seed is consumed to treat high blood pressure. Celeriac is becoming popular as a part of trendy American gourmet eating. Currently California harvests about 23,500 acres per year, Florida 3,500 acres per year, Texas 1,200 acres per year, Michigan 3,000 acres per year, and Ohio less than 50 acres per year. California harvests year-round, Florida harvest from December to May, Texas from December to April, Michigan and Ohio from July thru September. Per capita consumption of celery is about 9 to 10 pounds per person annually. What is your favorite sandwich? Leave me a comment. Search on this site will take a little time to re-index due to the site URL name change. In a bowl, mix all ingredients together. Spoon tuna salad on your favorite bread or bed of lettuce. Enjoy! This does make for a nice lunch, tuna salad is something I enjoy but do not have it very often for some reason. I will need to look around my pantry to see if I have some..thanks for the inspiration. Yum! You know, my daughter and I were talking about celery the other day and I kept meaning to look it up! Thanks for this, it came at a perfect time! I don't always appreciate the texture, but I like the flavor and the nutritional benefits of celery. My favorite sandwich is turkey, provolone, lettuce, tomato, avacado, stone ground mustard on sweet dark bread. I could potentially turn anything into a sandwich, given enough leftovers! Thank you for sharing this! Perfect sounding tuna salad...it's one of my favorites! This has to be one of my Dad's all time favorite lunches! I also like turkey, provolone, lettuce, tomato, avacado, mustard on dark bread... so good. Yeah, you can just about put anything between bread. I also could eat this any time of the day. Hi Christine! I had no idea that celery was such a domesticated plant! If you asked me what my favorite sandwich is this week, I promise it will be different from last week. I've been going thru a sandwich renaissance recently and experimenting like mad! However, my favorite STYLE of sandwich right now is the panini! I have a lot of favorite sandwiches. Panini rock! Great blog! Thanks for your comments on mine too! I love your tuna sandwich recipe. I've also made it with canned chicken (from costco) and it's very good too. Thank you so much. That means a lot to me. I love it when you come and visit. I enjoy the time I spend with you. Interesting post. I'm new here and glad to find your blog. I love tuna salad sandwiches and make mine the same way. 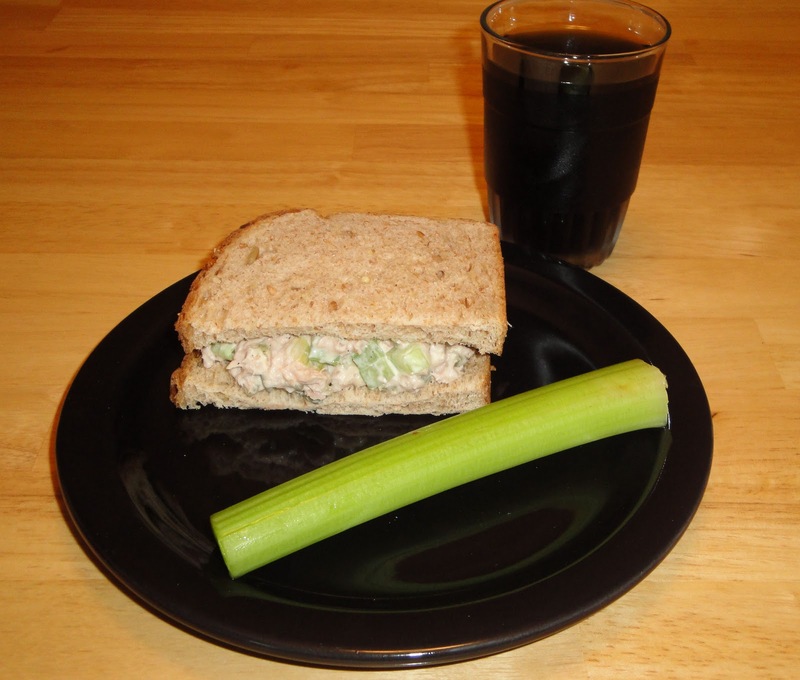 Your tuna salad sounds perfect, and great info on celery, Christine! I'm a huge fan of it. I love the crunch it adds to my chicken and tuna salad! Welcome! We are glad to have you here. As always, I love the food history you include in your posts! You are a wealth of information. I never knew the medicinal properties of celery. Hi Christine, since yesterday, I wasn’t able to link from your comment (in my blog) to your blog. Then I remembered I did bookmark an earlier recipe of yours… and luckily, here I am. Celery is definitely one of my favorite veggie and I like canned tuna chunks.. Your sandwich will be perfect for me..
What a fantastic story about celery! I have just planted a punnet in my garden and I will definately be "blanching" then. The fact that you threw in some historical facts about food almost makes us best friends. I love all the facts!!! And the sandwich doesn't look half bad either! I love food history, so interesting to me. We are friends and happy to be your friend. Hugs. It's always a pleasure to read about your interesting info on all the foods products. Celery is a huge favorite of mine...good to know about the medicinal value of this crunchy veggie! This is exactly how I like to make my tuna salad, with relish and of course, chopped celery and green onion. Love your tuna salad sandwich! Hi Christine, been 2 days, I wasn’t able to link from your comment (in my blog) to your blog. Then I remembered I did bookmark an earlier recipe of yours… and luckily, here I am. Sorry you had the issue with the link. Did you have time to make my recipe that you bookmark earlier? Let me know how it come out. Love to hear feedback on my recipes. Tuna sandwiches are my absolute favorite--and their pescetarian friendly! It looks delicious.